This is an Authentic "Wood" Deer Head! Hoosier National Forest on December 31, 2004.
altered in any way other than by nature. the patron saint of Hunters and Trappers. known for its many religious legends, forest and hunting. "Another unique feature of the church is the statue of St. Hubert and the deer. According to legend, he was a hunter and unbeliever. Once converted, he became an active missionary in the forest area of the Ardennes; He became known as the patron saint of hunters and trappers." As a young man Hubert loved to hunt. On Good Friday while everyone else was in church, Hubert decided to hunt deer. In a clearing he saw a huge stag and as he prepared to shoot the deer turned. To Hubert's astonishment a crucifix shone brightly from between the deer's antlers. Then the deer spoke and said, "Hubert, unless you turn to the Lord, you shall fall in to Hell." Falling to his knees, He asked what he should do to be saved. "Find the Bishop Lambert of Maastricht, came the reply, "and he will tell you." 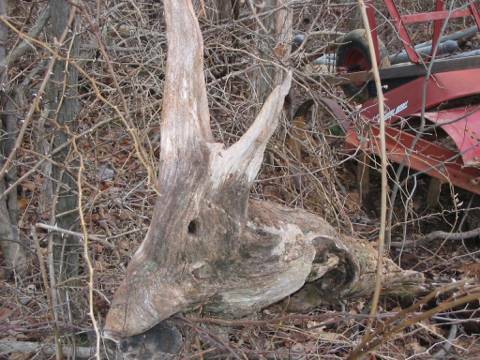 deer camp about this Wooden Stag Deer Head!